Harper went to the movie theater and saw her first feature film last Saturday! We chose the Disney Nature movie "Bears" and it went great. I wasn't worried that she'd be scared or upset (I went knowing that only fish were killed in the movie) but I did think she might get bored. She stuck with it the whole way, sitting in my lap once or twice. We were the only poeple in the theater so I wonder if she'll be distracted by others the next time. I'm just glad her first movie experience was a good one. We plan on raising a movie lover! Our new cat, Willoughby, is truly a member of the family now. She clearly was ready for a house to live in because it really took her no time to figure out the cat box and to be comfy all over the house. She's not too pleased now though. We got her spayed last week and she's living with the Cone of Shame for about ten days. Check the stinkeye. The saddest part is watching her try to just have a bath. She sits in all those regular cat positions, but she can only lick the inside of the cone. It's hilarious, poor thing. Man, when the cone comes off and the stitches are out, it's going to be a huge lick fest. It had to be done, of course, we are responsible pet owners and she has been and indoor/outdoor cat even when we brought her in, officially. And we knew it was time as she was desperate to get outside at night and making all kinds of crazy meow sounds. Plus there were a few other cats who suddenly showed up in our backyard from time to time. Did I mention desperate to get outside? She and Harper get along well, though Willoughby is still a kitten and can sometimes scratch Harper when she gets excited. That's no fun. But Harper is learning to be careful around Willoughby and does give her gentle "pat pats". They can be pretty cute together. Harper had her first pony rides the other day. We were tipped off by other friends about the pony rides in Griffith Park. (Being a Westsider, I had not really dived into Griffith Park yet for things to do with Harper except for Travel Town once last year.) We were going to go with these friends, but alas, they had to cancel that day, so it was just Harper and me. It was OLD SCHOOL! And I loved it. I think Harper did to, though this first picture on her first lap around might not indicate it. 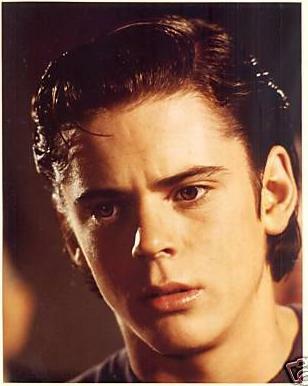 I wasn't sure how she would like it and the wild thing is, you buy your ticket, get in line, hand the Pony Guy (Ponyboy?) your ticket AND YOUR CHILD and he just grabs up your kid, plonks them on a pony, straps the belt around and pushes the pony to its chute and off they go! Harper, as ever, was chill and just went with it. Parents are not allowed inside the ring area at all. She smiled big when I called over so I knew it was good. One ticket is good for two circuits. When she finished I asked if she wanted to go again and she said yes, so I bought two more tickets. When she finished her second go-round she said, "Down?" (meaning also "done") so she got down and we stood there and then she looked back at the ponies and said, "Again?" I laughed and pulled out the third ticket and up she went again. When she finished, there was a big high-five for Gus, the Pony Man. Best $9 I've spent in a long while! ($3 a ride) Can't wait to do that again. The real ponies were Tuesday. Thursday we went to the Santa Monica Pier Carousel for some fake pony rides. First time Harper's been on a carousel. Big week for firsts! Also, as an aside, did you know The Sting shot at this very carousel? Again, wasn't sure if she'd like it (you sort of assume yes, but hey, she might not!) so I only bought one ticket to start. Then we bought two more. Cheaper than real ponies! 3 rides = $6. I love this last expression plus the one handed riding..."I'm cool, Mama, I got this!" By the way, when you are standing on a carousel (to get better pics/video), the centrifugal force is pretty surprising! It's a lovely place, highly recommend! Meet Our New Family Member! We adopted a new cat. Well, I should say she adopted us. She showed up in October as a kitten, just hanging around our house. We started feeding her because she never seemed to go anywhere else. No collar, very very scared and seemed feral. But she started warming up to us and in the last month or so has spent a lot of time with me and Kurt in the office, sitting in our laps, playing, napping, just being a cat. So this week we took her to the vet and she has now spent two nights in the house, officially ours. Her name is Willoughby and she's really sweet. Though the claws are a drag from time to time as she hasn't quite learned to retract them when playing! Harper has helped us feed her while Willoughby was outside. Harper says her name but it comes out "Ee-bee" or "Wee-Bee". The CUTEST thing was one night we were going to feed the cat who had not appeared and Harper stood on the porch yelling, really yelling, "EE-BEE! EE-BEE!" OMG I about died. Cute Overload. Mouse, our 17 year-old odd-ball cat is not too pleased, but she's also curious. I hope they become good friends soon because Mouse needs a snuggle buddy. She's not a lap cat but used to snuggle with Bunny. Mouse has not slept on our bed since Bunny died two years ago. Very sad. We want her too, but she just doesn't. So having Willoughby in the house and sleeping on the bed is so sweet. Her purring is LOUD and that makes me laugh. I really have missed a cat on the bed at night. Bunny used to sleep under the covers in the winter. She had cold toes. I miss Bunny a lot. One of these days she'll be excited by these cuties. We went to see the birds there, the Lorikeets. That was fun--you buy a little cup of nectar and they come eat out of the cup and hang out on your arms. Harper seemed to like the birds up close. We only stayed a short time, then came home for nap time. The beauty of the membership is easy in/easy out. We'll be going back again soon I'm sure. Neither Kurt or I took a photo yesterday, but he saw this on Grace's FB page and so we ganked it to post here. Nice picture Grace! Met a new friend on morning walkies yesterday. Sweet! It was a sock monkey kind of day. Dang the flash on the iPhone is bright. Sorry Mouse!